A week has swiftly passed since last I wrote. Finally tomorrow progress on LABYRINTH SUBLIME: THE INSIDE PASSAGE continues. The morning shift is scheduled to commence applying the aqueous sealant to our printed sheets. I’ll forward details about this stage once I have photos to share with you. Also tomorrow the arrival of the resupply of our custom paper is expected, allowing printing of the final pages and endleaves to resume Wednesday or latest Thursday. With this lengthy delay, Pat has returned to our home and studio on Salt Spring Island to attend to other affairs, including medical appointments pertaining to his severely injured ankle. Although we miss one another terribly, it’s best that he stays while I continue here at Friesens. Whereas we had originally thought that the lithography followed by our visual inspection of all pages of each unbound tome would be completed by Valentines Day, it now appears that the inspections will only begin February 14th. I’m hopeful that ten days will see the inspections complete, and that LABYRINTH SUBLIME will be ready for shipment to the bindery in Ontario by the end of February. I’ve brought my office with me bringing hard-drives of information along with my lap top. From the outset there was to be a five-day layover between lithography and inspections while trimming, folding and collating were taking place. Rather than spending two of these days travelling we had elected to stay in Manitoba. That this layover has lengthened considerably is unexpected, but so be it. I’ve been entertaining myself with such things as organizing the Salt Spring Island Folk Dance Festival, an annual spring event Pat and I founded eight years ago. On the festival’s rudimentary website you can read about what it is and our motivation for volunteering so much of our time: Each year a television-quality DVD is produced of the dance classes and performances. Pat does all the filming and one of the dancers produces the DVD package, considered by the folk dance community to be the finest being made in North America. It’s a wonderful, cultural celebration that we’d love to share with you all! You can view a movie clip by clicking on the Introduction and Montage of Memories. Saturday was a day out of town spent with Doug Symington, Friesens VP of Sales and his wife Deb. I’d like to share four photos I took during this outing. 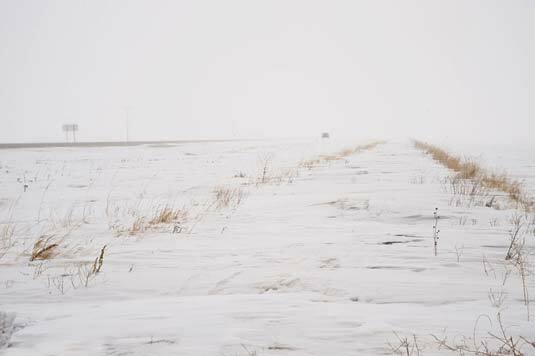 This white out condition across the prairie is actually fog resulting from the warmish air flowing across the cold landscape. The dark dot at the point of convergence of the highway and lines of grasses is an auto. In this next photo rays from a weak sun spilling through thinner cloud brought out the bright colour of the bark of the Yellow Willow. We drove to the James Valley Hutterite Colony where we were warmly greeted, enjoyed a hearty hot lunch, and toured homes, cooking facilities, food storage — for root vegetables and a few thousand jars of preserved vegetables and fruits — the dairy, cheese making, butchery and sausage and fish-smoking operations, clothing sewing and stocking knitting, book bindery, antique-filled barn and so on. I learned so much on this one day of these industrious people whose communal living, values and customs date to the 1500s, while taking advantage of modern technologies. We left late in the day with an armload of gifts including a Hutterite history book, fresh buns and jam to go with them, a jar of corn, a bag of soup bones, colourful knitted slippers, and many fine memories. I appreciated the kindness of everyone and their joyous nature: the young women who were making apple juice, our host Johnny Hofer who is the German bible studies teacher and book author, his 75-year-old mother, her sister and all whom we met. 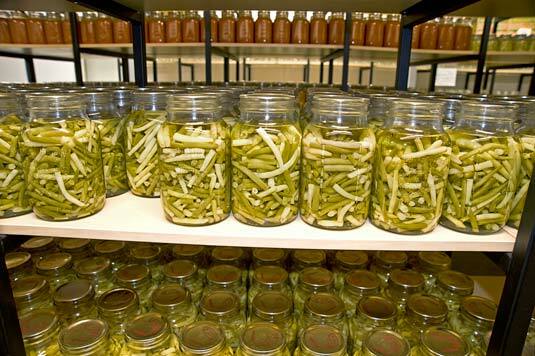 Here’s neatly organized two quart jars of canned beans, and tomato paste beyond. 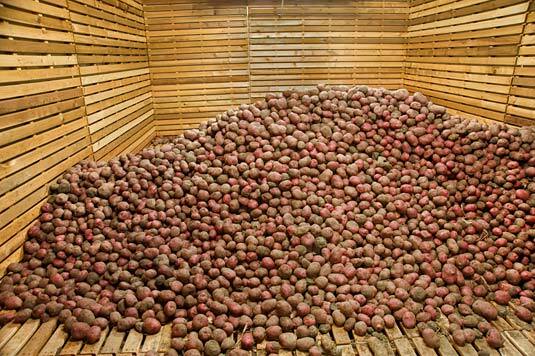 The potato storage room at the James Valley Hutterite Colony. Temperatures over the weekend were slightly above freezing which caused the accumulated snow to diminish by half. 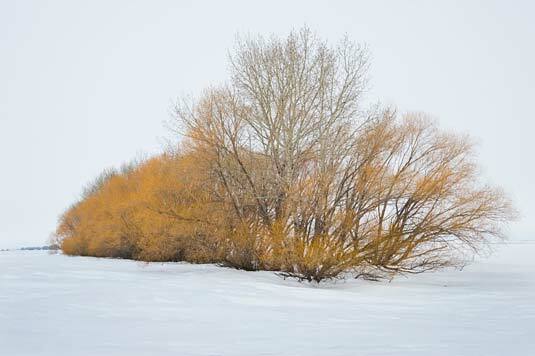 People are really happy because they are quite worried about the possibility of severe spring flooding of the Red River due to the snow here and in the Dakotas to the south. The Red River flows north to Lake Winnipeg then onward to Hudson Bay and the Arctic Ocean. The problem with rivers that flow north is that southern tributaries are in spring flood while the rivers and lakes to the north can be still frozen over. The resulting break-up of ice can jam at constrictions, causing the waters to back up and flood. With nowhere for the water to go, floods in recent times have temporarily created lakes miles wide across the prairies. Today temperatures were back to normal at -22°C plus a stiff wind. When I have more news I’ll be back in touch.